A&J is Madison and Milwaukee’s 24/7 emergency and non-emergency water damage restoration specialists. We work with your insurance carrier from extraction services to rebuild. 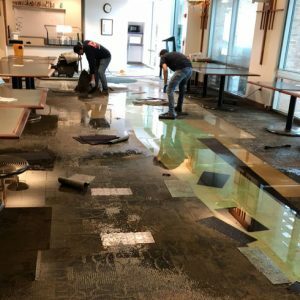 When you suffer from damage caused by a burst pipe, leaky dishwasher, flooded basement, heavy rains, or other water loss in your home or commercial building, call A&J for immediate response. A&J Property Restoration DKI will handle everything from the initial board-up to rebuilding your home or business after a fire. 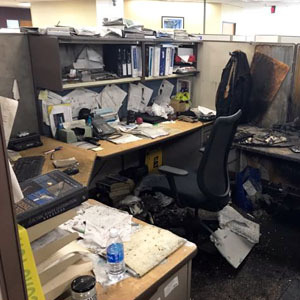 A&J restores fire damage, smoke damage, removes smoke odors and cleans your personal belongings or business contents. We handle fire damaged kitchens, large loss commercial fire damage, electrical fires, fire and smoke claims, and fire damage. Discovered mold in your home or commercial space? Do not disturb it. This helps prevent mold spores from spreading and decreases potential health risks to you, your family, or building occupants. 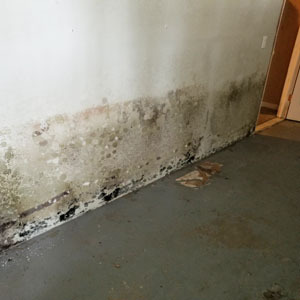 A&J Property Restoration’s mold remediation specialists will stop the water source that’s causing the mold growth and then use equipment to eradicate mold particles. Sewage damage caused by a sewer backup, septic system overflow, broken waste pipes, toilet overflow, or flooded lakes or rivers requires professional sewage cleanup services from A&J Property Restoration DKI. Sewage waste is grossly contaminated and poses a serious health risk should you encounter it without protective gear on. Call A&J immediately for cleanup services. 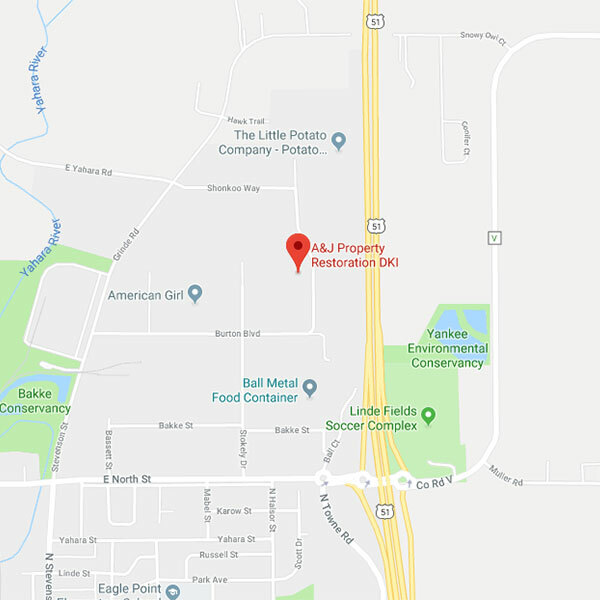 A&J Property Restoration is a full-service emergency and non-emergency damage restoration company serving all of south-central Wisconsin, Madison, Milwaukee, Waukesha, Wisconsin Dells, and the surrounding areas. A&J is a leader in the commercial and residential restoration industry, providing 24/7 emergency fire and water restoration, water damage clean up service and water damage restoration service, sewage clean up services and black mold removal service. We also specialize in tough cleaning projects and offer residential and commercial cleaning services. A&J’s emergency response team will help get you back on your feet as quickly as possible with a unique combination of expertise and compassion. Call us 24/7 at 800-727-8990! Does your company or business have an Emergency Response Plan (ERP)? Save precious minutes in a restoration emergency by joining our Code Red Immediate Response Program. We sit down with you and prepare a restoration emergency response plan for your business or facility. This ensures the fastest response time to any emergency you have. Time is your worst enemy in a loss – talk with a representative today! In 1984, Kent and Lynn Rawhouser took the first steps to pursue their dream of owning their own business. Walking door-to-door as a two-person sales team, they started by offering acoustical ceiling tile cleaning services. 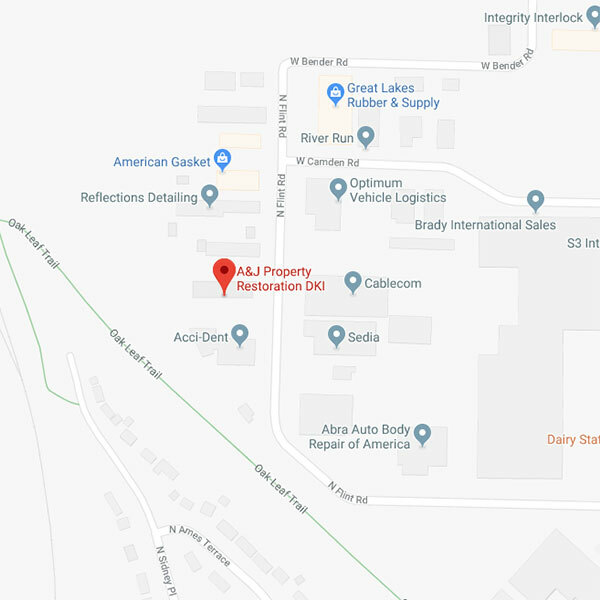 Over 30 years later, A&J Property Restoration is a leader in the restoration industry, with an expert team serving all of southern Wisconsin. During the past three decades, Kent has earned multiple certifications held by only a handful of other restoration professionals in the world. As business and homeowners themselves, Kent and Lynn combine expertise with compassion to help companies and residents get back on their feet as quickly as possible after a restoration emergency. The team at A&J Property Restoration is dedicated to getting you back on your feet as quickly as possible after a restoration emergency. We specialize in commercial and residential water damage restoration, mold remediation, fire restoration, and sewage cleanup. We also have a specialty cleaning division. If you have a mess you need cleaned up and don’t know who can take care of it, give us a call! Tough cleaning projects are what we do best! We are also experts at helping you prepare an emergency restoration plan for your business. Our Code Red Immediate Response Program is designed specifically for companies who want to make sure they’ll know how to respond when disaster strikes. For more information on how you can prepare for the worst and receive access to discounted prices, check out our True North Immediate Response page. Have a restoration project you need help with or just have some questions, give us a call at 800-727-8990 or email us on our Contact Us page. Honesty and transparency are core values at A&J Property Restoration. We strive to be advocates for our clients during the difficult insurance and legal complications that sometimes accompany a restoration emergency. We make sure that our clients are in the loop, fully informed. 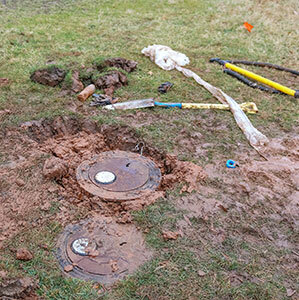 Our clients have immediate access to our technician’s project notes and photos. We explain the restoration process fully during a project, and thoroughly discuss major decisions and changes before they are implemented. We are a service company and serving our clients best interests is the mindset that drives everything we do. What does A&J’s DKI partnership mean for you? DKI is the largest Disaster Restoration Contracting Organization in North America. By joining forces with DKI, we have access to more resources, which means when a widespread disaster hits, you won’t have to wait for help. Commercial or residential disaster restoration services – water damage, fire and smoke damage, storms, high winds, hail, tornado damage, and 24/7 catastrophe response – our disaster response teams are ready. #RestoringKindness is a movement that was started in 2015 to invite and to challenge our hometowns and surrounding communities all over the world to do something kind for a stranger and expect nothing in return.